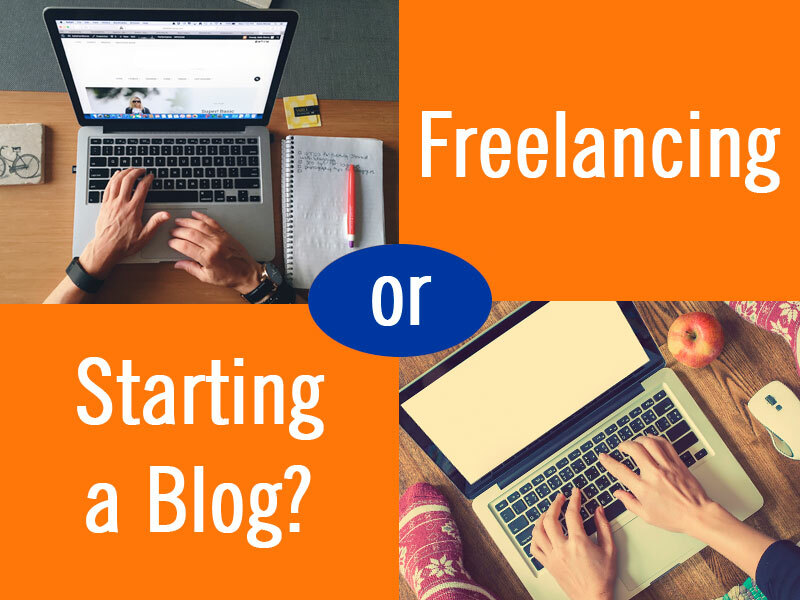 What is better: to start a blog or try freelancing? There are plenty of people who would like to make money on their own and be their own boss. They would like to do something online but they do not know whether it is better for them to start an online blog or to try freelancing. Each entrepreneur has his/her own journey and path to success. Lets look at some details so that you could decide what is better for you: to start an online business or try freelancing. Freelancers perform certain services and get paid for this. Such services range from writing stories to editing photos and helping people organize feasts and parties. You can turn any random skill into freelancing. Some examples of freelancing include tutoring, photo and video editing, helping people meet their couples, being a tour guide, etc. You just perform the service and get paid. You do not have to worry about other aspects like marketing and other things that come along with running your own business. If you are running a blog, you always have to think about promoting. You constantly must be working on your business without any time off. If you choose a freelancing job, you do not have to think about SEO, trying to find the audience or outsourcing your design work. You limit your potential income. There is a possibility that you do not have a skill that sells well. You have to be organized and be very good at time management. As soon as you make up your mind to get your new blog up and run it, there is a risk that you will get caught up being excited about launching a blog and will make a lot of mistakes during this process. According to my personal experience, it is so easy to destroy what you have done concerning blog, sometimes even miss useful opportunities and don’t take advantage of them. You have a higher income potential as you can make all of the money. Freelancers get paid a flat rate for the services they provide. People who run their own blogs use freelancers to help make big money. Besides, such businessmen can add various income streams to their blogs, such as advertising or affiliate reviews. Freelancers have no option of adding any revenue streams as they usually get paid just for the provided services. You are in control of every aspect of your business. The decisions concerning the direction you go in and products you release are all yours. You have a wonderful opportunity to share your ideas with other people. You probably have amazing unique ideas or fascinating stories to share with the world. When you are starting a blog, you get an opportunity to tell them to lots of people. If you are good at telling various stories, then you will be able to become very famous online. You risk not making any money. Freelancers get paid for their work. Bloggers need find ways to monetize their sites. Everything is on your responsibility. You should worry about all the aspects of your business. There is a high competition. Today every person seems to have his/her blog. During your first days of blogging, you have lots of creative and interesting ideas. Since it’s new as well as fresh, it’s not hard to resort to publishing like a madman and getting all of your ideas out. Initially, you are going to suppose that posting every day won’t be difficult at all, but you will undoubtedly slow down. As a result, it will get only harder and harder. By the way, some bloggers think that setting a blogging schedule is not of great need and therefore, they become very lazy and stop updating for a long time. Blogs that look like huge, frightening walls of text make their readers bounce in a hot minute. In spite of the fact that your idea might be amazing, presentation is also half the battle. One of the best recommendations is breaking up paragraphs by including headers between them, so that your audience gets certain anchor points. It is suggested that your paragraph has from 3 to 5 sentences. It has been discovered that people read only 20% of your text content. This figure shouldn’t depress you because very often one photo is more valuable than 1000 words. Studies has shown that not more than 10% of readers simply bounce without even paying attention to what you have written. What is more, the biggest part of your audience reads just 50% of your post. When your reader makes an attempt to comment, the worst mistake would be ignoring this visitor. Someone tried to talk to you but got not even noticed. As a matter of fact, your audience will never increase, if you behave like that. Have you ever thought which posts your audience enjoyed best? Are you aware of the ways people are searching your information? Considering that analytics data is irrelevant may be compared to the process when you throw darts in the dark. You can install Google Analytics and get to know various insights about your blog. If you face with some other blogging fails, write them in the comments!